In the immediate aftermath of the second World War, Indiana Jones returns home from his time with the OSS, now weary of his daredevil past. But just when he contemplates hanging up his hat for good, an old nemesis re-emerges with a plot to not only destroy the world's newly established peace, but also erase the last thirty years of history. In order to stop him, Indy must journey into the heart of the legendary Devil's Triangle where he will decide to either wipe out the sins of the world, along with his own mistakes, or renew his journey and remember the adventure! The project was spearheaded by longtime IndyCast co-host Keith Voss, who conceived of the story's central macguffin and served as the team's executive producer. It was then relayed to playwright and producer Tim Bungeroth, who transformed that vision into a feature length screenplay. Finally, that screenplay was adapted for audio by Raiders Radio founder Alex Levitsky, who not only engineered the drama and its unique score but also voiced the role of its titular hero. Behind them was a mountain of Indy fans and creative professionals who worked on and encouraged the project throughout its five-year development cycle. Like in any classic Indy adventure, the production team endured many twists and turns along the way but, in the spirit of their story's iconic hero, ultimately emerged with an artifact to share with the rest of the fans. "I was always curious about Indy's OSS days since hearing that line in Kingdom of the Crystal Skull," says executive producer Keith Voss. "I felt that after that line alone there were further adventures in store for Indy, either in comic, novel or radio drama form. Given the time period and the mystical circumstances, the Bermuda triangle would be a perfect fit for an Indiana Jones adventure, so I got right to work." 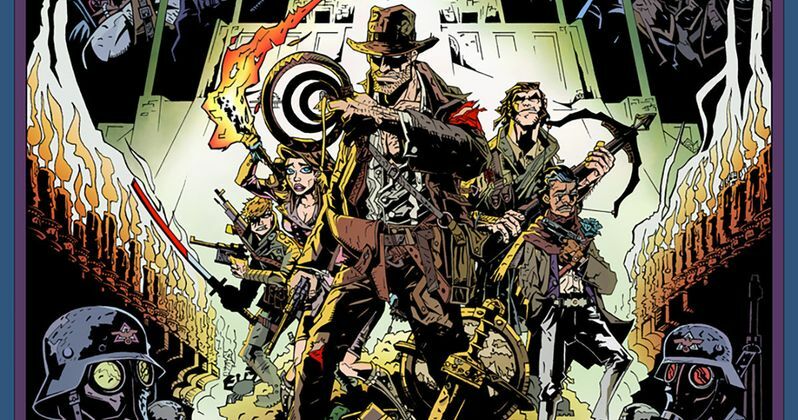 Voss, who had originally adapted some of Indy's Marvel comics into audio dramas, worked on the story in various mediums until he was approached by playwright and IndyCast listener Tim Bungeroth. "When I was brought on to write the script, I wanted to make sure that the theme and macguffin were also a larger manifestation of Indy's personal and emotional conflicts," Bungeroth says. "Last Crusade employed this paradigm by juxtaposing his relationship with his father with the search for the Holy Grail. In this story we're witnessing a post-WWII Indy who is reflecting on what his life might have been had he made different personal choices, and this parallels the larger conflict he'll face within the Devil's Triangle." "We quickly realized that we wanted to create a blueprint for a movie that theoretically could have been made in 1995," Bungeroth reveals. "And if we had that template then we could bring in other artists and creators to adapt this story to other mediums. Our dream was to create a fan project that mimicked Lucasfilm's Shadows of the Empire campaign and were determined to make everything but the movie itself." "I was cast as the lead because my voice naturally fell into a similar tone," Levitsky says. "But the role requires more because it's not simply playing Indy - it's playing Harrison Ford playing Indiana Jones. So I studied the unique minutiae of Harrison Ford's taylored portrayal of Indy over four films and found a middle ground between them. It was an understood 'must' that the audience believe." "I created an audio company called Raiders Radio Productions as a home for adapting the words, building audio imagery and interactive scenery, in order to bring out the tactile qualities of Tim's screenplay," Levitsky says. "The story-telling used a balance of music, effects, and interlinking dialogue to salvage and bring out all of the crucial plot points. Much of this came from what could be done by looking at the the stylings of Ben Burtt." "The music was equally key in conveying the tagline 'Remember The Adventure,' which permeates this story," Levitsky says. "It draws you into believing again, it makes you part of the excitement by relating to the characters' highs and lows, the whimsy, the emotional gravity, and the adventure!" "The IndyCast was created in 2007 in the lead up to the release of the anticipated Indiana Jones and the Kingdom of the Crystal Skull," remembers founder and lead host Ed Dolista. "Soon I was joined by a number of like-minded contributors including Mitch Hallock, Laird Malamed, Joe Stuber and Bridge to Yesterday story writer Keith Voss along with thousands of listeners in over 50 countries. With over 300 episodes under our belt, including specials, radio dramas and music retrospectives as well as interviews with many on camera and behind-the-scenes talent from the Indy series, Young Indiana Jones Chronicles and comic book series, The IndyCast is thrilled to be a small part in the fandom of Indiana Jones." As Dolista continues to carry the torch of Indy fandom, he's excited to finally share this project with the very community he's worked so hard to connect. "I am excited to have Keith, Alex, Tim and the Raiders Radio team presenting Indiana Jones and the Bridge to Yesterday as part of the IndyCast. We have dabbled in radio dramas before, with some small adaptations but we have never had an epic feature-length production of this scale on the show before. I think listeners are not only going to be amazed at the high level of quality on all levels of the production, from sound effects, music and of course voice acting, but they will feel like this is their own personal Indy film that will take a rightful place in the Indy pantheon as we get ready for Indy 5." As Lucasfilm prepares another installment of its esteemed franchise, the fans won't have to wait much longer for Indy's next great adventure. On April 5th 2019 tune in to The IndyCast and "Remember the Adventure!"